Download this free quick reference guide for teaching and understanding the Facebook Profile page (also known as the Wall). The Facebook Wall is the central location for the most recent information posted by you - and about you. Anyone (the public or your friends) can visit your wall but what they see depends on your privacy settings. 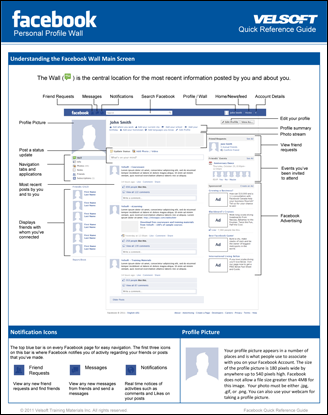 This quick reference guide outlines the fundamental layout and most commonly used features of the Facebook Profile Wall and gives you a quick summary of how the Wall is structured. This free download is made available from Velsoft and, as with all Velsoft training materials, is completely customizable. When you download this easy reference tool you receive two files; a .pdf document and a MS Word document. The .pdf version is easily shared and print ready. Word version can be customized and you are welcome to make any changes you like in order to make best use of this resource in your training. Most Facebook users spend the majority of time on either the News Feed page or their Wall. The posts all your friends make show up on your News Feed. The simple way to describe the Wall is the place where you see all your activity, while the News Feed is where your see the activity of your friends. There are also many other areas on Facebook to share your thoughts, activities, images and videos but the Wall is central to your Facebook experience. Download this free quick reference guide and share it with your students, co-workers, friends and anyone else you like.